Check this page often, as this is where Genesis Soils will keep you updated with the latest in product releases, customer responses, and dynamic photos showing the results of using our innovative products. Field applications are well underway, as root growth is starting well before shoot growth appears in new plantings as well as older more mature vineyards. Contact Genesis Soils for more detailed information, we would like to help you solve many pressing concerns you may have. Additional applications will begin in the spring targeting harmful minerals in soils previously unable to support healthy grapevine growth. Mycorrhizal colonization of the plants root system will naturally adjust the plant to accept only the nutrients that are buffering the excessive rates of harmful minerals. Please see technical papers on this subject. Genesis introduces Rhizo-Gen granular in GenSoil for grape nursery application. All of the proprietary components are also in this nursery soil. We understand nurserymen are all very different in their desires for the soils that works best in their nursery, so we are offering custom blending for each special need. At Genesis our approach is perhaps different than others from the perspective that we do not use a “filler”, or components that do not have a specific value added to the mix. We only use components that add to the health of the plant. For example Perlite and Vermiculite provide no value to a healthy soil, sawdust and shavings are far too unstable to use due to their specific requirement of nutrients robbed from the soil to assist in their decomposition. We use only value added natural components that give not only the plant a healthy home, but most importantly, a home for the Rhizosphere to grow. We only use and recommend organic fertilizers. Please visit our photo gallery and view the two young grapevines, one with Rhizo-Gen Gensoil and the other with a rudimentary nursery mix not Genesis. Sometimes pictures tell a thousand words! This is a culmination of many years work. The complete package with the mycorrhizal species indigenous specifically to grape vines in combination with the proprietary elements that Genesis has learned over the last 27 years. Rhizo-Gen liquid can be applied in the nursery environment as well as injected directly into existing vineyard drip systems. If our customers are unable to purchase a Rhizo-Gen grapevines from a nursery then we can give them the next best solution, to inoculate your young vineyards. Remember you only need to apply Rhizo-Gen once in the plants lifetime. Rhizo-Gen liquid applied on several hundred acres of existing vineyards in the Salinas Valley. We are additionally interested in the application for salt tolerance. It has been widely known for many years that plants with proper mycorrhizal inoculation will withstand extreme saline conditions. 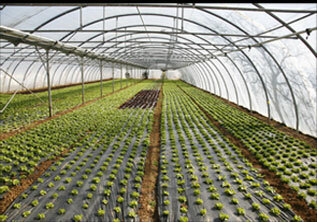 Please refer to the picture gallery depicting the young pepper plants that were subjected to high salt conditions in the soils. Also please read the published papers on this subject in our website. Rhizo-Gen Liquid applied on existing young vineyards at Spring Mountain Vineyards through the drip system. Mercier / Genesis grapevines are planted at Spring Mountain Vineyards. Genesis understands that plants are more draught tolerant, more efficient in their uptake of nutrients, there are many other benefits that are widely known in the science and farming communities. The most compelling for Genesis is the “Antagonistic Potential Against Disease”. Science and out planting has proved that mycorrhizal inoculation significantly reduced disease for years. We are most interested in the suppression of Leaf Roll Virus. At Spring Mountain Vineyards, Ron Rosenbrand, vineyard manager and Genesis has elected to plant these Rhizo-Gen grapevines contiguous to an extremely high infection of Leaf roll in existing older vineyards. We are closely monitoring these vines for the next several years to see the results. Please visit our technical papers related to the suppression of Leaf Roll in other areas using mycorrhizal inoculum. The results of the planting are evidenced in pictures comparing Rhizo-Gen soil, with massive root systems and the rudimentary mycorrhizal inoculum with literally no roots, not Rhizo-Gen. The out planting results are also shown in the form of additional pictures. Please enjoy! Ron Rosenbrand, Vineyard Manager for Spring Mountain Vineyard, and a pioneer in the use of mycorrhizal products formally endorses Genesis. Click here to view his letter. Also, Ron is on the cutting edge in dealing with vine mealy bugs. 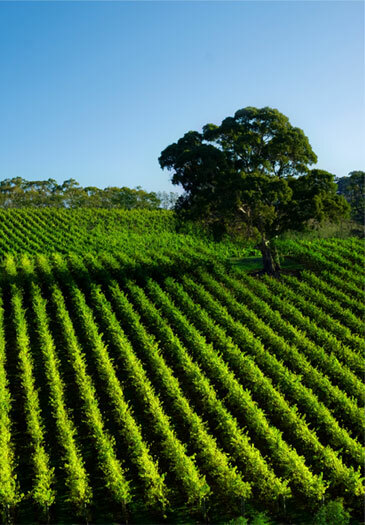 Click here to read how this innovator is changing the way vineyards manage their crops. Significant results for the grape nursery as evidenced through trial data attached. Please visit the results. Genesis Soils has begun its penetration of the formidable grapevine nursery industry this summer, by offering trials of its GenSoilTM Pro Mix to growers and vineyard operators for final seasonal plantings. Genesis is partnering with key growers in an effort to demonstrate the power and benefits of its mix technology. The Pro Mix is compared to standard growing practices in scientific trials so overall advantages are clearly evident. The mix provides key elements that ensure an overall healthier plant with greatly increased survivability. Based on trial results so far, Genesis anticipates making a significant impact in the industry during the main plantings for next season. "The response has been overwhelmingly positive, as growers are reaching for the best in organic farming practices as well as the latest in technological advances", says Bruce Coulthard, Director of Sales and Development. Anyone interested in inquiring about trial possibilities should contact a Genesis representative at the Trial Hotline 707-287-6111. In an effort to continue to offer cutting edge science to its customer base, Genesis Soils, LLC. has introduced a series of additional products. "Genesis is simply responding to market demand", commented Bruce Coulthard, Chief Operations Officer for Genesis. "Our customers are constantly evolving, and if we are to stay competitive, we have to evolve also." Genesis has added growth packs with a proprietary blend of mycorrhizal fungi, organic fertilizers, and several other components that are designed to super boost a plant's growth and health. Additionally, Genesis is now offering bagged, as well as bulk GenSoilTM, Organic Compost, and Gypsum. Genesis Soils is currently working with major landscapers, city and county officials, as well as the water district to help proliferate its innovative products.